Bryant and his crew did a great job. Great customer service and prices are very affordable. They totally exceeded my expectations. I totally recommend them for all your plumbing needs. I found Mr Fix it Right Plumbing on Yelp. I had a great experience with them and they was the cheapest by far. Punctual and professional services. Comparable prices...Mr. Fix It Right is now my go to plumber! This is my first review I've every written on the internet because it was truly necessary to share my wonderful experience. Mr. Jackson of Mr. Fix It Right Plumbing & Rooter was extremely accommodating with my emergency leaking tub faucet. First impression, was that of a caring and helpful person. Despite his busy schedule, I was somehow fit in, and the problem with my constant running water was completely taken care of quick and efficient. I am very pleased. I would definitely recommend MFIT to ALL in need of an extremely fair, efficient, punctual, and professional company that goes out of its way to get the job done right! Friday afternoon disasster. At two pm, we realized that we had a serious problem. The two toilets on our first floor were backing up into the toilet in the floor below. We found some YouTube videos on backflow that offered some simple tips. They all said, however, that if these tips did not work, which they didn’t, that we should call a plumber immediately because backflow is a serious problem that can cause extensive, expensive damage. But, finding a plumber on Friday afternoon is nearly impossible. After several futile calls to other plumbers, Brian of Mr. Fix It Right answered and said that he would be over in 90 minutes and he was. It took Brian a little time to figure out what was wrong. He worked like a detective eliminating possible causes. Meanwhile, it was getting dark and it had been raining off and on and everything was wet and slippery. He finally shouted, “I got it.” And he figured out and fixed the problem. Not only was Brian smart and hardworking, he was courteous and personable. Thank you, Brian! I has a clogged tub drain. The guys came out on time and did the job for a good price with no B.S. I was very satisfied with the professionalism and quality of work. I would highly recommend them. See what locals are saying about us in the customer testimonials below. Also, be sure to check out our Yelp reviews to see why we're the Oakland plumber with a 5 star rating! For more references and reviews of Oakland plumber, Mr. 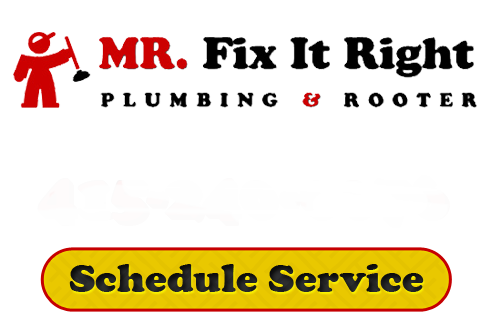 Fix It Right Plumbing and Rooter, please call 415-240-0076 or complete our online request form.